I was recently asked by a high school assistant principal from San Antonio what a good mentoring program could look like. In the name of sharing what I have found to be succesfull (I have put together some unsuccessful programs! 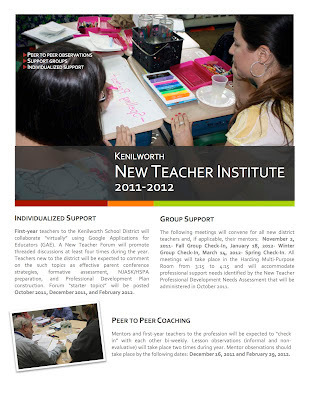 ), I outline a three-pronged approach to facilitating a worthwhile and productive year-long support program for new teachers. 1. Schedule mentor/mentee observations twice during the year- I have found success in requiring mentors to formally observe mentees once in the fall and then again in the winter. I hire one substitute and have each mentor released from teaching responsibilities for one and a half hours. This time allows the mentor to conduct a one hour observation and then debrief with the teacher for a half hour. The mentee plans an independent activity for the students while she and her mentor talk about the observation. I require the mentor to keep the discussion private so that the feedback is used strictly for the purposes of professional improvement (not for evaluative purposes). 2. Plan two to three personal gatherings of all the mentors and their charges- I administer to all of the district's mentors and mentees a needs assessment in September. The results determine my planning of two or three formal after-school, one-hour workshops. The sessions are conducted in the fall, winter, and spring and are structured to specifically accommodate the requests made via the survey. I invite fellow educational leaders or veteran teachers to assist me in my facilitation of the sessions and frequently ask the mentors to come to the gatherings prepared to share their failures and successes related to the topic of the meeting with the entire group. 3. Facilitate two virtual discussions online- Because everyone is so busy, and I do not want to take up too much after-school time, I conduct two discussions online using Google Apps. The discussion is only open to the mentors and mentees, and I post a topic each "session." I tweak my Google App settings to notify me whenever a new post or a reply to a post is listed so I can constantly monitor the discussion. The following topics have framed discussions in the last two years during which this component of the program was facilitated: "What to do with parents during conference time?" "Teacher Professional Development Plan ideas for 2012-2013," "June Closure and Preparation for 2012-2013," "Managing the challenging class."